Scary Monsters magazine _#100 - A Handful Have Been Unearthed! MyMovieMonsters.com > Scary Monsters Magazine > Scary Monsters 1-100 > Scary Monsters magazine _#100 - A Handful Have Been Unearthed! 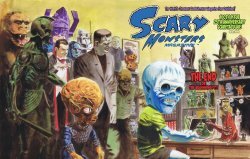 The historic 100th issue of Scary Monsters magazine is certain to be a sell-out very soon! Includes 180 pages of classic monsters! Very limited quantity available. The 100th issue contains all of your fear-vorite features and sections. Plus, check out the new editor's article, "Monster Movies from Mammoth to Miniature: Part 2 of 2" which is the follow-up to Part 1 that appeared in issue #99! Full color cover and vintage B&W content. A whopping 180 pages! Collectors Note: This is the final issue released by the former publisher. All ads, contact information and merchandise related to Scary Monsters magazine appearing in this issue are no longer valid. Please direct all inquiries to scarymonsters@mymoviemonsters.com.